History @ QFF. Jawel, ik heb weer een oude hobby opgepakt. Geschiedenis en archeologie. En wel te verstaan de Oude Wereld geschiedenis. Oude beschavingen, ruines van oude steden als Ur, volkeren die floreerden 1000-en jaren voordat er ook maar 1 Egyptenaar het levenslicht zag. De moderne mens is zijn lange termijn geheugen verloren en "geschiedenis" gaat voor de meesten niet verder dan WO 2 of Napoleon of zo. Men ziet in musea wel de oude voorwerpen van volkeren maar kunnen zich eigenlijk helemaal niet voorstellen hoe die mensen leefden en dachten. (Misschien was dat wel hetzelfde als tegenwoordig). Dus door middel van informatie wil ik die oude tijden doen herleven en mensen attent maken op wat mensen konden maken en doen lamg, lang geleden. Schitterende steden en zo oud dat volgens onze geschiedenis de mens nog in berenvellen rondliep. Ik ga in deze serie niet in op zaken als HOE hebben ze dat gebouwd hebben en of ze wel of niet hulp hebben gehad van de Anticosmic Federation Of Destroyed Worlds. Wat ik wil bereiken is een soort van besef creeren bij de lezer. U vindt onze steden groot? Dan zul je nog verrast zijn van de afmetingen en "cijfers". We zullen zelfs op de grens komen van "toelaatbare aanname" inzake ONZE geschiedenis..........."What would you think when the thing that should not be is right in your face?" Klein dingetje nog, uhmmm deze serie zal vooral in het Engels zijn. Namelijk, het meeste zal knip en plakwerk zijn van artikelen waar ik (en anderen; onafhankelijken) achtersta en correct is. In elk geval zonder "mythologisch tintje. Ten tweede om mijn lezers die de taal niet machtig zijn een beetje tegemoet te komen. Zij hebben al geruime tijd vertalers in moeten schakelen en dat was niet voor iedreen even handig. En aangezien de gemiddelde QFF-er zo'n 3 talen spreekt.......lol. Okee, let's kick off shall we! ?BXALBAK Approximately 86 kilometers northeast of the city of Beirut in eastern Lebanon stands the temple complex of Baalbek. 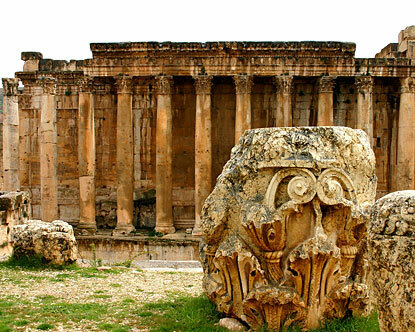 Situated atop a high point in the fertile Bekaa valley, the ruins are one of the most extraordinary and enigmatic holy places of ancient times. Long before the Romans conquered the site and built their enormous temple of Jupiter, long even before the Phoenicians constructed a temple to the god Baal, there stood at Baalbek the largest stone block construction found in the entire world.The origin of the name Baalbek is not precisely known and there is some difference of opinion among scholars. The Phoenician term Baal (as the Hebrew term Adon) simply means ‘lord’ or ‘god’ and was the title given to the Semitic sky-deity worshipped throughout the archaic Middle East. The word Baalbek may mean 'God of the Bekaa valley' (the local area) or ‘God of the Town’, depending on different interpretations of the word. Ancient legends assert that Baalbek was the birthplace of Baal. Some scholars have suggested that Baal (the Assyrian Hadad) was only one of a triad of Phoenician deities that were once venerated at this site - the others being his son Aliyan, who presided over well-springs and fecundity, and his daughter Anat (Assyrian Atargatis).In the Seleucid (323-64 BC) and Roman (64 BC-312 AD) periods, the town became known as Heliopolis, the ‘City of the Sun.' The sky/sun god Jupiter became the central deity of the shrine during this time. Arguably the most important deity of the Romans and taking over the role of Zeus in the Greek pantheon, Jupiter was probably chosen to replace the much earlier worship of the Phonecian god Baal who had many characteristics in common with the Greek Zeus. Many Roman emperors were of Syrian birth, so it would not have been unusual for them to have promoted the worship of the country's indigenous deities under their adopted Roman names. 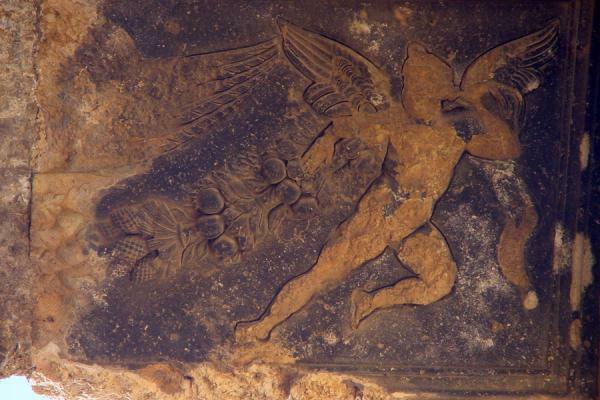 Whatever the nature of the pre-Roman worship at Baalbek, its veneration of Baal created a hybrid form of the god Jupiter, generally referred to as Jupiter Heliopolitan. The Romans also assimilated the worship of the goddess Astarte with that of Aphrodite or Venus, and the god Adonis was identified with Bacchus.The origin and development of Baalbek may be considered from two quite different paradigms of prehistory, one the conventional approach that views civilization as having only begun in middle Neolithic times and the alternative approach which suggests that developed cultures existed in what is archaeologically known as the Paleolithic period. Let us first examine the chronology of Baalbek from the conventional interpretation, following which I will discuss some amazing site anomalies that can only be explained by recourse to a far older and now lost civilization. According to theories stated by the mainstream archaeological community, the history of Baalbek reaches back approximately 5000 years. Excavations beneath the Great Court of the Temple of Jupiter have uncovered traces of settlements dating to the Middle Bronze Age (1900-1600 BC) built on top of an older level of human habitation dating to the Early Bronze Age (2900-2300 BC). Biblical passages (I Kings, IX: 17-19) mention the name of King Solomon in connection with a place that may be ancient Baalbek (“And Solomon built Gezer and Beth-Horon, the lower, and Baalath and Tadmor in the wilderness”), but most scholars are hesitant to equate this Baalath with Baalbek and therefore deny any connection between Solomon and the ruins. Because the great stones of Baalbek are similar, though far larger, than the stones of the temple of Solomon in Jerusalem, archaic myths had arisen that Solomon erected both structures. If Solomon had really erected the site of Baalbek, however, it is astonishing that the Old Testament has mentioned nothing of the matter.After the time of Solomon, the Phoenicians became masters of Syria and chose the site of Baalbek for a temple to their Sun-god Baal-Hadad. Little is known of Baalbek from this period. The late 11th century BC witnessed the arrival of an Assyrian army on the Mediterranean coast but because Baalbek is not mentioned alongside the names of other Phonecian cities, it has been assumed that Baalbek was an obscure religious center with no political or trading importance.The first-century AD Jewish historian Josephus tells of Alexander's march through the Beqa'a on his way to Damascus, during which he encountered the city of Baalbek. Following the death of Alexander in 323 BC, Phoenicia was ruled successively by the Ptolemaic kings of Egypt and the Seleucid kings of Syria until the arrival of the Romans. The name Heliopolis, by which Baalbek was known during Greco-Roman times, derives from Greek association with the site beginning in 331 BC. Meaning ‘City of the Sun’, the name was also used by the Ptolemies of Egypt between 323 and 198 BC, in order to express the importance this holy site held for the Egyptians. A sacred site with this same name already existed in Egypt and the new Ptolomaic rulers may have found it provident to link the ancient sky-god of Baalbek with the Egyptian god Re and the Greek Helios in order to establish closer religious and cultural ties between their newly established Ptolomaic dynasty in Egypt and the eastern Mediterranean world. In the historical writings of Ambrosius Theodosius Macrobius, a Latin grammarian who lived during the 5th century AD, the god of the holy place was called Zeus Heliopolitanus (a Greek god) and the temple was mentioned as a place of oracular divination, similar to such sites as Delphi and Dodona in Greece and the temple of Amun at Siwa in Egypt.The golden age of Roman building at Baalbek/Heliopolis began in 15BC when Julius Caesar settled a legion there and began construction of the great Temple of Jupiter. During the next three centuries, as emperors succeeded one another in the imperial capital of Rome, Heliopolis would be filled with the most massive religious buildings ever constructed in the far reaching Roman Empire. These monuments functioned as places of worship until Christianity was declared the official religion of the Roman Empire in 313 AD, following which the Byzantine Christian emperors and their rapacious soldiers desecrated thousands of pagan sanctuaries. At the end of the 4th century, Emperor Theodosius destroyed many significant buildings and statues, and constructed a basilica with stones from the Temple of Jupiter. This signaled the end of Roman Heliopolis. The city of the sun declined and lapsed into relative oblivion. In the year 634, Muslim armies entered Syria and besieged Baalbek. A mosque was built within the walls of the temple compound, which was itself converted into a citadel. 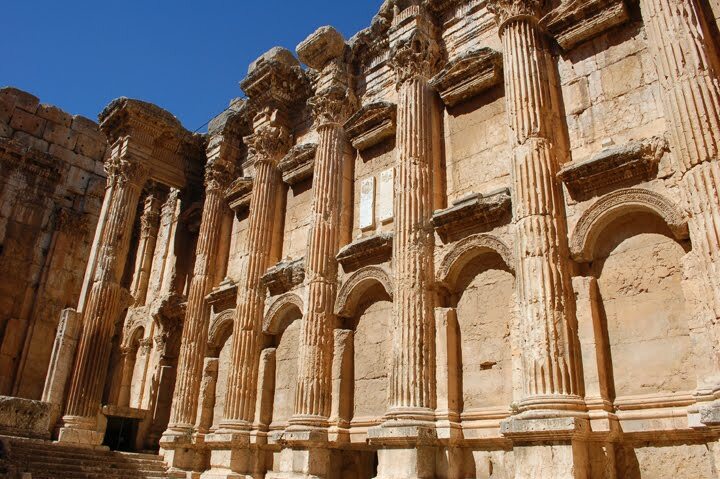 Over the next several centuries, the city and region of Baalbek were controlled by various Islamic dynasties including the Umayyads, Abbasids and Fatamids as well as the Seljuk and Ottoman Turks. 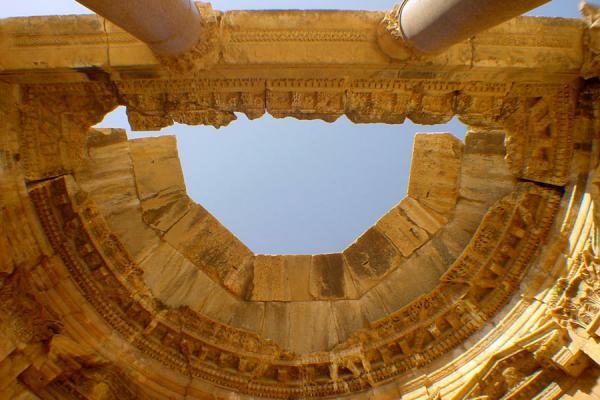 During these years, Baalbek was ravaged by the Tartars in 1260, Tamerlane in 1401 and was also shaken by numerous powerful earthquakes.De rest lees je allemaal in deze link. Natuurlijk daag ik je ook deze keer weer uit zelf eens wat meer te zoeken dan alleen wat hier staat. Het is als een virus, als je het eenmaal te pakken hebt,......*FEAR BASED DENIAL*Nexion2. Het gebruik van de Geometrie alleen al WOUW! Dit waren geen steden, maar op zijn zachts gezegd Metropolen! De Hindu Vallei is er ook zo een. Dit zijn gewoon kunstwerken. Er is zoveel kennis verloren gegaan. Mooi topic! Kom hier zeker terug!! Vannacht lekker die enorme berg info lezen van de link. Mooi onderwerp. Ga straks lekker lezen. Ben zelf ook erg geïnteresseerd in oude beschavingen. Heb zelf ook wat ideeën, maar wacht eerst op waar jij mee gaat komen. "Baal" betekend letterlijk "Heer". In al zijn facetten. "Baal" had zowel betekenis in het allerdaagse leven als in de religie of whatever you wanna call it.